Woman: [on voice message, crying] Jacob, it's Bianca. I'm in trouble. I need your help, please. I have something they want. Jacob, I don't know what to do. Please, call me. First of all, what a movie! When I heard about this movie through the cinematographer's page here on IMDb (fits perfectly with the story), I was shocked to see the 6,4 rating and the critic reviews. 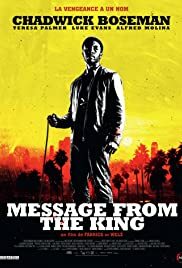 Chadwick Boseman shines as Jacob King, a mysterious man from Cape Town looking for his sister in Los Angeles. Director Fabrice Du Welz made good use of the locations to show us the gritty side of the city. The performance of the supporting cast is excellent for this kind of movie. For the critics who wrote their thoughts on this movie, I say this: I do not know what your problems are with this movie, but I do not see any problem with this movie. You should probably give this movie another go. For the ones you who are going to watch this on Netflix at home, be shocked for the ending. 41 of 68 people found this review helpful. Was this review helpful to you?